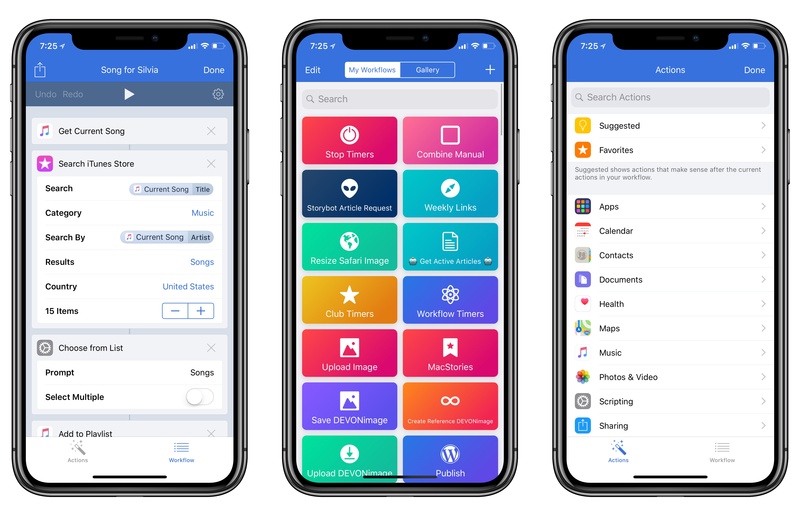 Workflow, the iOS automation app acquired by Apple earlier this year, received a major update today, adding support for the iPhone X and a variety of iOS 11-only features. Drop content onto the Play button to run a workflow with that input. iOS 11's drag and drop largely obviates these limitations: if you want to run actions for an image in Workflow 1.7.7, you just need to drag the image and drop it into an existing workflow. Want to turn some rich text into Markdown? Simply pick up a block of text from Notes, drop it into Workflow, and the 'Make Markdown from Rich Text' action will see the dropped item as input and convert text to Markdown. The same is true for videos, audio files, PDFs, or URLs; anything that can be dragged in iOS 11 can now become an input source in Workflow. 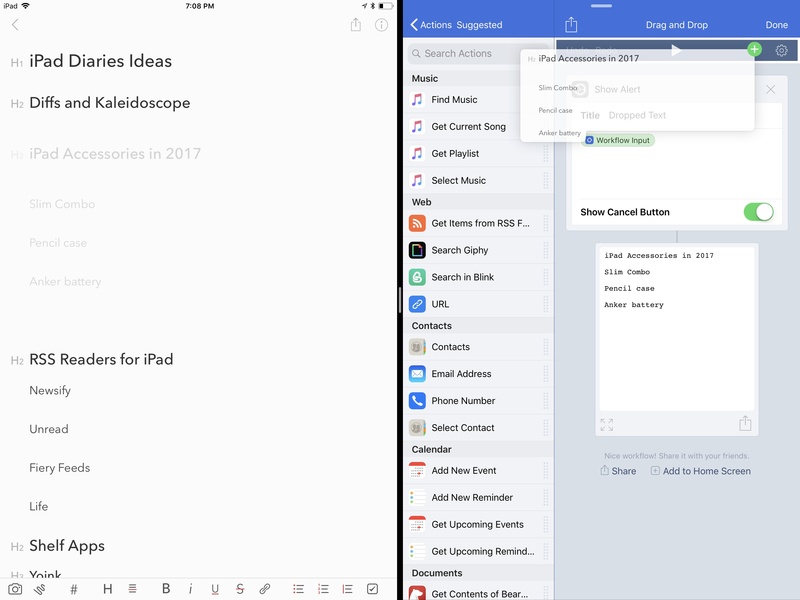 Drag and drop is a major addition to Workflow's automation environment, and a perfect way to take advantage of iOS 11's focus on iPad multitasking. It adds a visual, tactile layer to Workflow that can make the app's automation features more approachable and easier to explain. I'm already considering how some of my workflows could be used exclusively via drag and drop now, with Workflow pinned in Slide Over and ready to accept input through drag and drop. It's going to be interesting to see how Workflow's Content Graph engine and advanced functionalities such as conditional blocks will tie into this as well. In addition to drag and drop, Workflow 1.7.7 integrates with other key iOS 11 features: Files and Photos. The Convert Image and Encode Media actions have been updated to support HEIF and HEVC – the new image format and codec in iOS 11, respectively. As for the new Files app, Workflow uses new APIs in iOS 11 to support saving and opening multiple files at the same time. 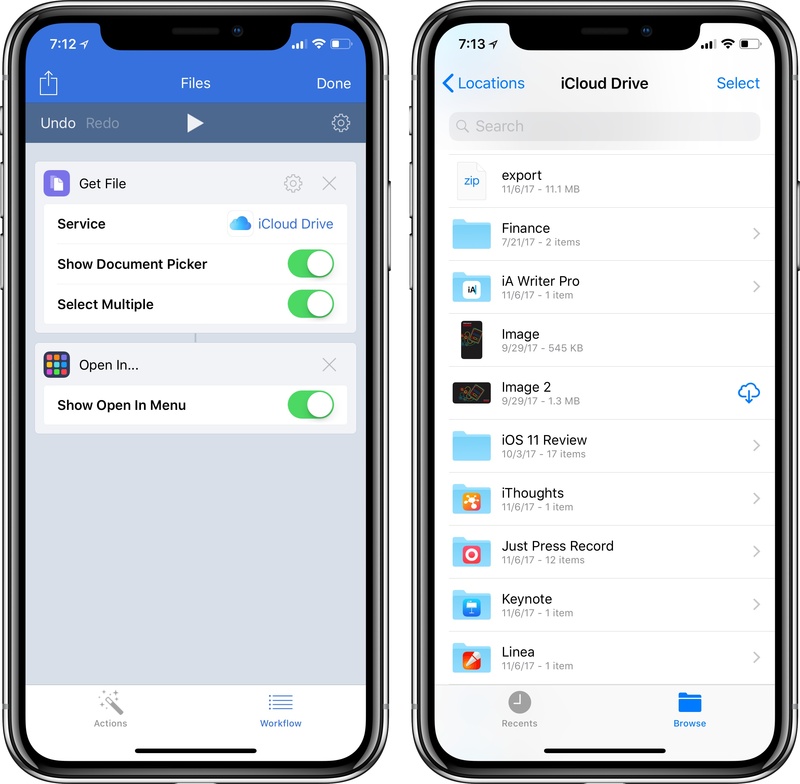 Lack of support for multiple file operations has long been one of the primary shortcomings of iOS; before iOS 11, apps could only open and share one file at a time. I'm happy to see that we'll be able to automate this lesser known improvement of iOS 11 as well, as it should speed up document-based automation considerably. But the iOS 11 improvements don't stop here. Workflow supports the new data types for Health in iOS 11 (such as insuline delivery and waist circumference); the Tweet and Post on Facebook actions have been fixed due to the removal of social accounts in iOS 11; and last, there are dozens of miscellaneous fixes and improvements that should make the app run more smoothly (I've been noticing performance issues and glitches with the old Workflow 1.7.6 on iOS 11). While many – myself included – doubted Apple's ability to maintain Workflow as a standalone app without severely limiting its functionality, the company has been devoting resources to Workflow, refining its actions and expanding its native integrations with the OS. Workflow's update pace has slowed down since the acquisition, and it's still not clear whether Apple plans to turn Workflow into a native iOS automation layer in the future. For now, however, we can appreciate the fact that the Workflow team has been able to work on a substantial iOS 11 update, which opens up fantastic possibilities for iOS automation both on the iPhone and iPad. I plan to extensively cover the changes in Workflow 1.7.7 over the next few weeks in our dedicated Workflow hub and my iPad Diaries column, as well as Club MacStories. In the meantime, you can download Workflow 1.7.7 from the App Store and check out the full changelog here.